The advent of rock changed all that. Suddenly, jazz guitar players with open ears found themselves with access to a much broader and more expressive range of possibilities. They could hold notes like a horn player, moan and wail like a singer, sculpt sound like a studio wizard. This sea change seemed to make the guitar-piano-bass-drums bands a much more attractive lineup for jazz musicians. Beginning in the late 1970's you started to see these quartets more frequently and prominently: Pat Metheny with Lyle Mays, John Abercrombie with Richie Beirach, John Scofield with Jim McNeely, and so on. My generation of jazz musicians and jazz listeners is the first that grew up taking rock-influenced jazz guitar sounds for granted. 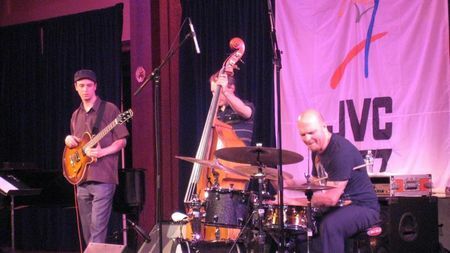 And our generational favorite guitar player is, without a doubt, Kurt Rosenwinkel. Back in those bygone pre-Napster days (i.e., the mid-1990's), imported bootleg tapes of Rosenwinkel's unreleased studio sessions and live hits circulated faster than designer drugs in an afterhours nightclub. His fluid lines and unabashed heart-on-sleeve romanticism made him the object of near-universal adulation. 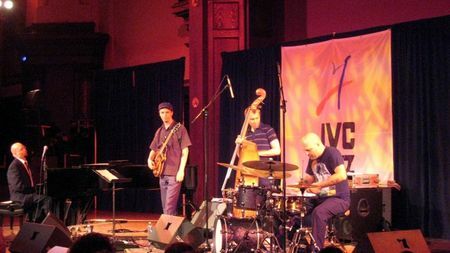 And Rosenwinkel has always had a clear, sympathetic relationship with piano players like Michael Kanan, Scott Kinsey, Brad Mehldau, Aaron Goldberg -- and, on Heartcore and some of those cherished bootlegs, Ethan Iverson. When Rosenwinkel and Mark Turner were rewriting the template for melodic, long-form original jazz at Smalls last decade, Ethan was there -- and bassist Reid Anderson, too. So when Ethan and Reid emerged from that scene in a trio with some insane Minneapolis-based drummer that became an unlikely major-label sensation -- just a few years after Kurt's Verve debut was finally issued -- well, it felt like a vindication. To many musicians I know, it felt like our music was finally coming into its own, finally garnering some recognition and support from the jazz mainstream. This is basically a long-winded way of saying that Tuesday's JVC Jazz Fest concert featuring Rosenwinkel, Iverson, Anderson and King seemed like a much-anticipated reunion gig -- never mind that Dave King had never previously played with Kurt, and Kurt had never previously played the Bad Plus songbook. And to be honest, the four of them got off to a bit of a rocky start -- after King's opening drum solo, when the quartet launched into "Big Eater" there was a fair bit of internal jockeying going on, made worse by some sputtering distortion in the sound system and the Society for Ethical Culture's boomy acoustics. Things loosened up considerably during Reid's Chopinesque "Love is the Answer" (from TBP's comparitively little-known debut on Fresh Sound) -- Kurt had room to stretch out a bit more, and Ethan's comping was especially tasty. By the start of the third tune, "Guilty," the sound issues had been mostly sorted. 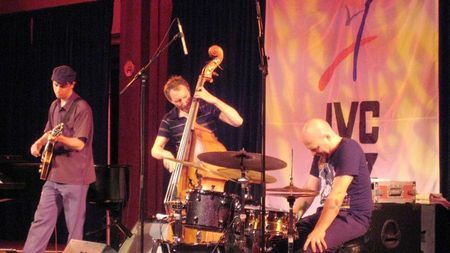 The Bad Plus usually treat "Guilty" as a kind of blues abstraction, and Ethan's spacious, conceptual solo was completely line with that view. Kurt was having none of it. When it came time for him to blow, he led things in an unrepentantly earthy direction. The two Rosenwinkel originals that came next -- "Turns" and "Use Of Light" -- were transfixingly beautiful, especially the latter's rustic melodicism. Then they forged ahead with a spirited romp through Ornette Coleman's "Song X" -- Ethan's solo began with some refined, quasi-Mozartian turns, an offbeat impulse that paid dividends down the line. The set closed with an extended take on Reid's "Silence Is The Question," which built upwards from the composer's solo intro into a languid rubato melody accompanied by lightly brushed guitar harmonics, and slowly, gradually blossomed like time-lapse footage, until it had become a glorious, ecstatic, breathtaking collective rush. When it was over, everyone in the audience stood up as one. There's really no following up a moment like that, but the crowd was not about to let the band go without an encore. They obliged us with a time-shifting routine on "Have You Met Miss Jones" -- I got the feeling this is a little something from the heyday of the Smalls scene -- capped with the Morse Code stabbing section from "Physical Cities." (Kurt remembered to turn over the page on his music stand just in time.) Fanservice? Maybe just a touch, but it was all in good fun, and hey, if you can't pull that kind of trick in front of a jazz festival crowd in New York, where can you do it? 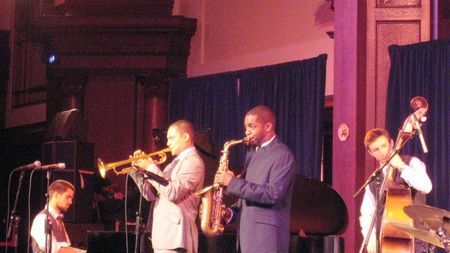 The opening group, which received no advance publicity whatsoever, was the British quintet Empirical, making their New York debut. Very young, very clean-cut, and sharply dressed, they looked and sounded a bit like a throwback to the old "jazz wars" (i.e., Wynton Marsalis and Stanley Crouch and Ken Burns and Jazz at Lincoln Center versus basically everyone else), with extended original tunes that owed a lot to the more conceptual 1960's Blue Note "new thing" records. Their music had many attractive moments but their vibe was a bit discombobulated -- I wanted to hear a more coherent through-line. The players are all incredibly talented musicians who never seemed to quite hit their stride. And the venue's swampy sound did them few favors. It felt a bit like a really solid Master's recital. These guys could benefit from a little more road-seasoning and a healthy injection of "kill your idols" attitude. Tickets to this event were provided by management. Is there anyway to get a hold of a recording of this? At least the Bad Plus/ Rosenwinkel set?